Price excluding VAT.(Incl. VAT £2,398.80) *VAT Relief available on this product. 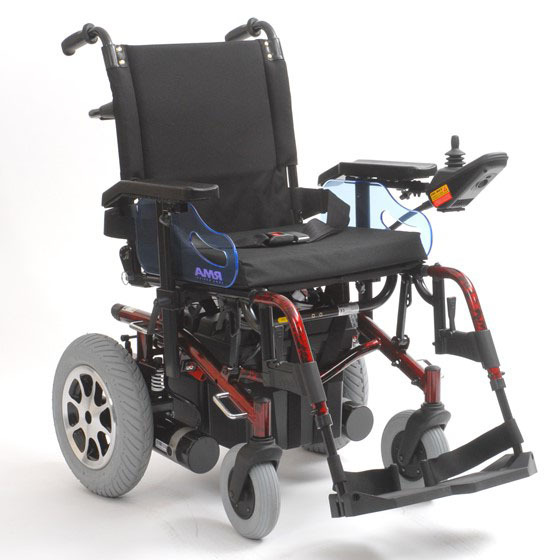 The Roma Marbella powerchair is a great choice for both indoor or outdoor use. It has an array of excellent features designed to suit most users. The rear wheel drive is complemented by dual rear suspension giving you a smooth ride on everyday journeys. As standard, the scooter is powered by 50 Ah batteries which will provide a travel distance of up to 25 miles on a full charge. Lift-up side armrests are included which are extremely helpful for side transfer. The angle of the seat and backrest can be adjusted up to 30 degrees, so you’ll be able to change this throughout the day. To enable the chair to get closer to a desk or table, swing in-and-out detachable footrests have been added. If you are recovering from a leg, foot, or ankle injury elevating leg-rests are available too. This powerchair has been fully crash-tested and can be transferred safely within a vehicle. The simple control panel allows you to adjust the speed setting, see the battery life, sound the horn, and turn the power on or off. The highly responsive joystick control makes manoeuvrability a real breeze; meaning you’ll be using the Marbella like a pro in no time. The Marbella has a top speed of 4 mph with a travel distance of up to 21 stone (136 kg). All in all, it has many excellent features at an affordable price.